I know many of you are always on the lookout for quick, healthy breakfast ideas, and I have a solid for you. This chia breakfast bowl has been in high rotation here for the past couple of weeks. 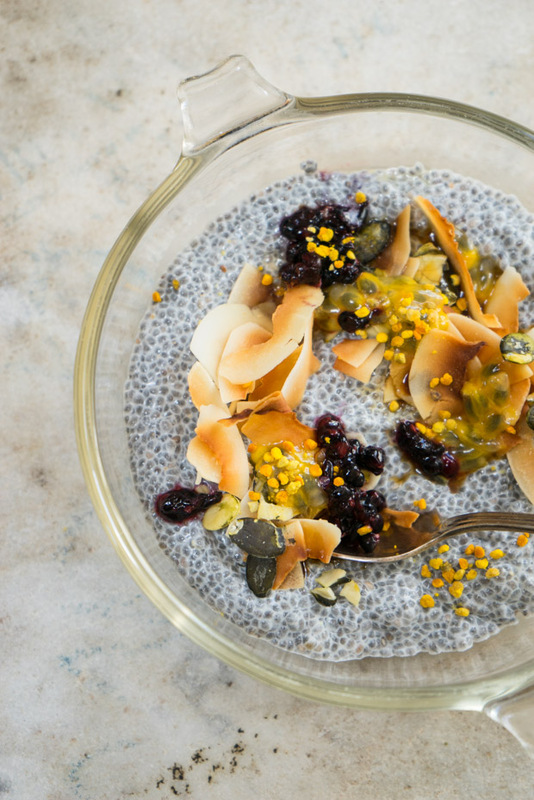 It's summery and bright, and if you can get on board with chia seeds in general, it's a nice way to start the day. Chia can be a funny ingredient to experiment with, and quite honestly, I'm not always a fan of chia preparations. That said, when I've found my groove with them, they're great - high in fiber, omega-3s, an ancient energy seed used by the Aztecs, Mayans, and Incans. I make a version of this bowl before a yoga class, or before a morning paddling / swimming in Lake Tahoe, and it really keeps me going, feeling strong. 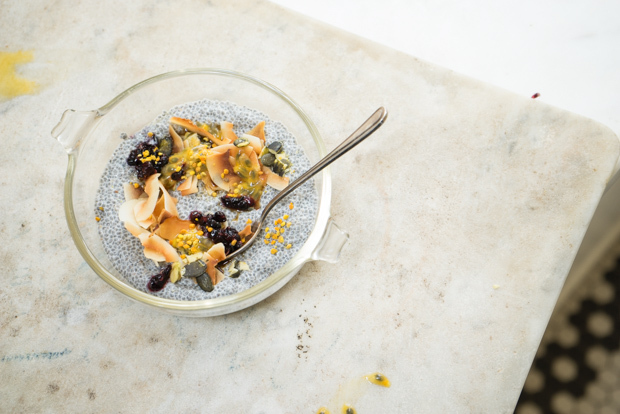 It goes like this - soak the chia seeds in your favorite nut milk, top with smashed berries, fresh passionfruit juice, pepitas, and big flakes of toasted coconut. A bit of bee pollen adds a boost and some pretty. If you like a thicker bowl add more chia seeds, if you like a thinner consistency go for less. Or if you've never tried them before, start with 1 tablespoon and work up if you like. Also, I used a (toasted) almond-coconut milk blend here, but any favorite nut milk will do. I sweetened mine with coconut nectar (love), but if you can use a bit of whatever natural sweetener you keep on hand. top with: toasted coconut flakes, seasonal fruit (I used passion fruit & blackberries), something with a bit of crunch (I used pumpkin seeds) - walnuts, sunflower seeds, granola, etc. A bit of bee pollen if you use it (and aren't allergic). Combine the chia seeds with the almond milk and stir well. Allow to sit for at least 15 minutes, stirring occasionally, or until the chia seeds completely bloom and soften. You can also do this step a night ahead, but I like the flavor better when the chia isn't allowed to sit for that long. Just before serving, sweeten to taste with preferred sweetener, and then top with toasted coconut flakes, crushed seasonal fruit, and anything else you like. Makes one bowl. Double or triple the recipe based on the number of people you are serving. Quick, clever, healthy breakfast ideas are something I'm always excited to discover. I landed on what I think of as new healthy breakfast favorite this week, and instead of simply sharing that recipe, I thought I'd list it off with a handful of other feel-good day starters. A simple late-summer breakfast bowl - Greek yogurt with a bit of chopped dill incorporated, topped with sliced pluots, toasted oats, poppy seeds, and honey.